Recording video with your Flip camera is as easy as 1-2-3 (and 4). Before you record video, check your Flip’s status display indicators to ensure that your camera is fully charged and that it has enough remaining recording time to capture the video you want to shoot. The Flip will tell you how much time you have left on your batteries and how much video you can shoot. Ready: In the top-left corner, indicates your Flip is ready to record video. Battery: In the lower-right corner, indicates your battery’s charge level. If the battery icon is flashing, your batteries are too low and need to be recharged (or replaced if you’re using disposable batteries with your Flip Ultra or UltraHD). Time Left: In the lower-left corner, indicates how much remaining recording time is available for capturing and saving video. Press the Power button on the Flip to turn on your camera (if it isn’t already on) and then point your camera’s lens at whatever it is you want to shoot. Use the display to frame your shot so you’re sure to capture what you want to shoot. Press the red Record button to start recording. You don’t need to hold the Record button while recording. 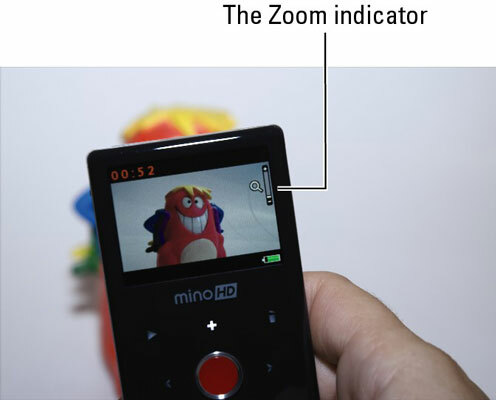 The red light on the front of your camera turns on to indicate that you are recording, and the time shown in red on the display increases to show the elapsed time for your recording as you continue to capture your video. (Optional) Press the Plus button to zoom in and the Minus button to zoom out. The Zoom indicator appears when you use the Plus or Minus buttons and shows the zoom level as you zoom in or out. Your Flip remembers your zoom level setting after you stop recording and then start recording video again. To turn off the zoom feature, press the Minus button until the zoom level reaches the bottom of the Zoom indicator. Your Flip “forgets” the zoom level when you turn off your camera. Videos that you record are stored indefinitely. The videos stay on your camera until you delete them, even if your camera’s batteries completely run out. Your recorded videos will still be there when you recharge or replace your camera’s batteries. Your Flip camera can’t record a new video over an existing video. This means that you don’t have to worry about accidentally recording new video over a video you captured and saved. The “Camcorder Full” message appears on the display when there is no more remaining recording time to continue recording videos. To make more recording time available, you can either delete some or all of the videos you captured but don’t want to keep, or connect your camera to your computer and copy some or all of your captured videos to your computer’s hard disk and then delete those videos from your camera to make room on your Flip to capture more videos. Your Flip camera has a continuous recording limit of 1 hour. After an hour, the camera stops recording and returns to Ready mode with no warning message or alert sound. To resume recording, you must press the Record button again to start recording a new video. 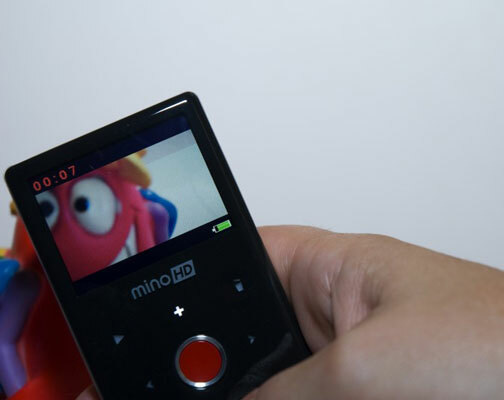 The exception is the MinoHD model, which has a maximum recording capacity of 1 hour. Your Flip won’t record video when you connect it to your computer or your TV. Your Flip records video only when it isn’t connected to your computer or TV; when it’s connected to either of those, your Flip basically turns into a memory storage device (computer) for shuttling files back and forth, or a video presenter (TV) for showing off your videos on the big screen.